Residents in the rural state of Maine grappling with a heroin epidemic and an aging population voted Tuesday to deliver a rebuke to Republican Gov. Paul LePage and join 31 other states that have expanded Medicaid under former President Barack Obama's health care law. LePage vetoed five different attempts by the state Legislature to expand the program. Tuesday's vote follows repeated failures by President Donald Trump, a LePage ally, and his fellow Republicans in Congress to repeal the signature legislation of Obama, a Democrat. "This is an exciting night in Maine, but also an exciting night for the country," said David Farmer, spokesman for pro-expansion Mainers For Health Care. "Voters have made it clear they want more health care, not less." For supporters and opponents of "Obamacare," Maine's question took on the form of a referendum on one of the most important pieces of the Affordable Care Act. Votes to expand had a nearly 60 percent edge late Tuesday, with more than three-quarters of precincts reporting. The contest took place in a politically charged atmosphere with GOP efforts to undermine, or repeal, the health overhaul. Here in the nation's Northeast corner, the issue was personal to many in a rural state that has the nation's oldest population and the region's lowest wages and has suffered from a string of mill closings. Passage of the proposal means an estimated 70,000 people in Maine can gain health coverage. About 268,000 people currently receive Medicaid in the state. Maine's governor blamed an earlier Medicaid expansion for increasing state hospital debt, and he opposes giving able-bodied people more access to Medicaid. LePage often summarizes his argument by saying: "Free is expensive to somebody." He also warned that he would have to divert $54 million from other programs — for the elderly, disabled and children — to pay for the state's share of the expansion once it's fully implemented. LePage's office didn't immediately respond to a request for comment. Maine Republican Party Chairwoman Demi Kouzounas said she was "disappointed" by the result and that the party will continue to oppose "more dependence on government." Mainers For Health Care touted the proposal as a "common sense move" to ensure health care coverage for more people. 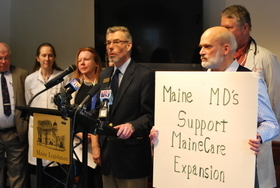 Maine's hospitals also supported the Medicaid expansion and say charity care costs them over $100 million annually. The initiative's supporters have reported spending about $2 million on their campaign, with hundreds of thousands of dollars coming from out-of-state groups. By comparison, the lead political action committee established to oppose the measure has spent a bit less than $300,000. This may not be the last state vote. Backers of Medicaid expansion in Idaho and Utah have started similar efforts to get the question on the 2018 ballots in their own states. Meantime, Ohio voters rejected a proposal Tuesday that sought to curb prescription drug prices paid by the state for prisoners, injured workers and poor people while supporting a crime victims' rights amendment with no organized opposition. The pharmaceutical industry spent an estimated $70 million to oppose Issue 2, the Ohio Drug Price Relief Act, saying it would reduce access to medicines and raise prices for veterans and others. Supporters, led by the California-based AIDS Healthcare Foundation, spent close to $17 million in support, saying it would save the state millions of dollars and could force the industry to reduce prices elsewhere. They called the opposition campaign an "assault on the truth." "Make no mistake: Although this particular campaign did not win tonight, it is just the beginning of an awareness in Ohio about what huge drug companies are doing to our people," the campaign said. "This system we have for drug pricing in America has got to give, and sooner rather than later, one state will successfully stand up to big drug companies and Ohio will wish it could have been the first." The measure would have required the state to pay no more for prescription drugs than the Department of Veterans Affairs' lowest price, which is often deeply discounted. Curt Steiner, who managed the opposition campaign, said voters "delivered a loud and clear message that Issue 2 was a deceptive and seriously flawed proposal. A large majority of Ohio voters concluded Issue 2 wouldn't have solved any problems; it would have made things worse."